You're now on your way to becoming an educated worker. Informed and educated workers are treated better and have more dignity at work. 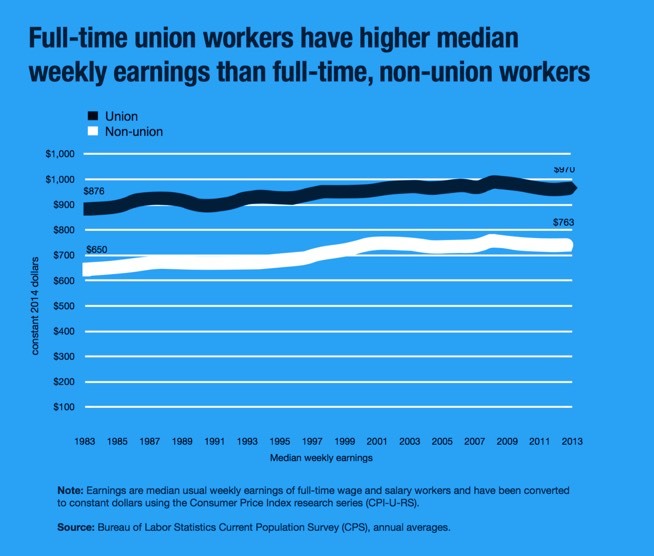 When more workers are part of a Union our communities are better off! Unions work to improve the lives of all hard working men and women like you everyday. Veterans, labor leaders and an elected official banded together to shed some light on how New Hampshire's proposed right-to-work law would affect the state's veterans in a conference call on Tuesday. Been Stiffed On Wages? Hurt On The Job? The White House Wants To Help. A new website, Worker.gov, seeks to make it easier to protect your rights. 10/28/2016 -- As the secretary of labor, Tom Perez spends a lot of his time explaining workers’ rights. Yet when he talks one-on-one with workers of all kinds, he’s noticed that many of them still aren’t aware of the legal protections they have. Originally enacted in 1967, this federal law prohibits employment discrimination on the basis of age against individuals in the age bracket 40 to 70. This federal law prohibits employers from using polygraph test for employment purposes except in several very restricted circumstances. Each state has a workers' compensation law that provides for medical care and cash benefits in the event that a worker is injured on the job. The Worker Adjustment and Retraining Notification Act (WARN) requires employers to give employees a 60-day written notice before a plant closing or mass layoff. Many federal laws have provisions that prohibit employer retaliation against workers for reporting violations of the law. In addition, some states have similar laws. This law, which became fully effective December 12, 1994, applies to employers and requires reemployment and time off for military service. COBRA is an amendment to the Employee Retirement Income Security Act (ERISA) which obligates employers to offer employees who would lose their health coverage because of separation from employment or other reasons an opportunity to continue their coverage for at least 18 months. This is a comprehensive federal law regulating pension and other retirement plans and health care benefits. This federal law provides unpaid, job-protected leave to eligible employees, both male and female, in order to care for their families or themselves for specified family and medical conditions. This federal law broadly prohibits discrimination against "qualified individuals with disabilities" in virtually all aspects of employment. Originally enacted in 1938, this federal statute establishes the nation's basic labor standards. It requires both public and private employers to maintain certain minimum conditions of employment. OSHA is the nation's basic work-place safety standards act. Federal employees are covered by agency rules that are based on OSHA. This law allows states to enforce safety standards consistent with federal safety standards. Thus, although basic responsibility for OSHA resides with the U.S. Department of Labor, in some states the first level of enforcement is with the state agency. In other states responsibility lies with the federal OSHA branch office.